As an adult, I rediscovered the practice of baking heartfelt gifts in my new community in San Francisco. 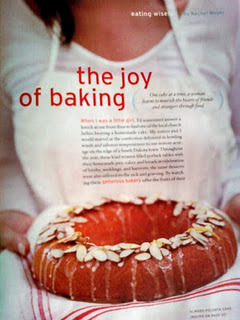 At one point, I decided to devote a year to baking cakes as offerings. Every Saturday morning I’d roll out of bed bleary-eyed, fill an empty bundt cake pan with batter, and give the resulting cake to someone in need of comfort or a little celebration. As I listened to the city wake up, I counted and chopped, mixed and measured. And in the process, my mind became still, my breath slowed, my body felt balanced and at peace. What I experienced was more than mixing butter and eggs — it was a practice in baking and giving from the heart. Some 60 cakes later, I see now how my “bundt cake Saturdays” have given me a creative outlet that, among other things, reminds me that compassion can transcend urban boundaries. Strangers on the street soften at the sight of my cake caddy, asking if that’s a cat I have hiding in there. Even the bus driver will wait patiently for “the cake lady,” going out of his way to drop me off at work, where my colleagues light up like children at the prospect of a new flavor to sample.